FILE - An election official checks a voter's photo identification at an early voting polling site in Austin, Texas. "There may well be confusion on Election Day, even if things are implemented the way the courts have decided," said University of California, Irvine law professor Richard Hasen. "Judges are beginning to wake up and see what some of these enacted laws are doing," said law professor Theodore Shaw, who heads the Center for Civil Rights at the University of North Carolina in Chapel Hill. "The lower courts and courts of appeals are finding that these voter ID provisions are discriminatory in either intent or effect, or both." FILE - An election official, left, checks the ID of a voter lining up to cast a ballot at a polling site for the New Hampshire primary in Nashua, Feb. 9, 2016. An appellate court found North Carolina's voter ID law had been enacted "with racially-discriminatory intent" and that its provisions "target African-Americans with almost surgical precision." In North Dakota, a federal judge held that voter fraud is "virtually non-existent" and that that state's proof of identity requirement "ensnares a disproportionate number of Native Americans, who are especially unlikely to have the documents necessary to obtain a voter ID." North Carolina Governor Pat McCrory accused federal judges of "undermining the integrity of our elections while also maligning the state." In a statement, McCrory noted that photo IDs are required to "cash a check, board an airplane or enter a federal courtroom." 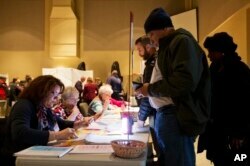 FILE - A sign tells voters of voter ID requirements before participating in the primary election at Sherrod Elementary school in Arlington, Texas, March 1, 2016. "It is imperative that the State government safeguards our elections," said Texas Attorney General Ken Paxton. "Preventing voter fraud is essential to accurately reflecting the will of Texas voters, and it is unfortunate that this common-sense law … was not upheld." Hasen said, while most Americans have a driver's license or a passport to prove their identity, many poor and minority voters have neither. "Imagine that you are poor person in Dallas [Texas] and you take the bus to work. You don't have a passport. You don't have a driver's license because you don't drive. 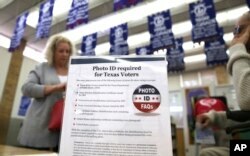 So you don't have the kinds of ID that the state accepts [to vote]," Hasen said. "You could go and get a free ID from the state. But if you happen to live far from one of the places that issues those IDs, you are going to have to take time off from work and pay to get yourself there. And you might not have the documentation. "So, for most of us, having the right kind of ID is not big deal. But there is a significant part of the population for which this is a big deal," Hasen added. FILE - People fill the waiting area of a Pennsylvania Department of Transportation office in Philadelphia as they wait to get a voter ID card, Sept. 27, 2012. Hasen expects the rulings of recent weeks to stand at least through the November elections. But that does not preclude the possibility of chaos at polling stations. "I think most people will be able to cast a ballot," he said. "[But] I do think there will be problems. Some of the problems will be administrative — not because the state is trying to discourage voting." "Laws passed in recent years in Wisconsin and Texas are much stricter than the ID law passed in Indiana," he said. "And the Supreme Court has changed. With the death of Justice [Antonin] Scalia, the court went from a 5-4 [conservative] majority on voting rights to a 4-4 ideological split. It's not clear that the court, at least until it gets another member, is actually going to give us any clarity on these cases." ""It's happened going way back throughout North Carolina's history since after the Civil War. But this is another day. This is the 21st century."